The vacuum collector system requires . . . (1) The vacuum collector itself. It mounts on the rear of the 700 series tractor and drives from the center PTO. It includes its own mounting bracket and doesn't require the 1690045 lift kit. 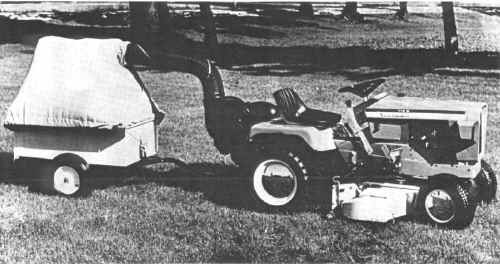 ( 2) The system doesn't include the adapter or "Boot" which mounts on the discharge opening of the mower. You must order 1690026 for the 48" mower or 1690027 for the 42" 700 series mower. (3) The 1600395 cart cover must then be added to the 1600236 dump cart to complete system. The cart cover inflates to handle large volume and deflates to give compact storage. For just picking up lawn debris, the 1690031 Roving Nozzle should be used.